el es frida kahlo is currently on view in the New Media Room at the Bruno David Gallery in St. Louis, MO. Frida Kahlo played with the identity that she wanted to project and the identity that was placed on her by others. Kahlo used her clothing, political affiliations, sexual escapades, and personal traumas, to create a character that informed her body of work. She inscribed her identity, painting her image over and over, constructing a mythology around her persona. el es frida kahlo will be on view at the Bruno David Gallery in St. Louis, MO from 1/22-3/6. In conjunction with the exhibition, I am offering a FREE embeddable animated el es frida kahlo gif on mayaescobar.com. a guest post by seeNoga. As you doggedly pursue, chase, and snap at the heels of your Self, you do so knowing there is no chance you will ever catch up. For each of us, throughout our individual lives, we will be ever distant from knowing our own selves. When a person pursues his or her Self in an aggressive, determined way, the resulting hyperactive sensibility allows for a greater adaptability and sensitivity. This flexibility can be useful in contemporary human life, but only to a certain extent. It is also due to the fast-paced nature of today’s engineered environments, that there is a strong tendency (especially among young people) to go to extreme lengths in order to sustain within their own lives the hyperactivity and intensity they witness in popular culture and media. Consider the called-for constant reachability via cell-phones and laptops, as well as many other forms of expedition in our ‘lived-in’ world. These accommodations range from aerodynamics to ATMs. As many workers in today’s professional world simultaneously lament and extol their parasitic relationships with a Blackberry or other such Pocket God, I, too, have at many times felt chained to my laptop (i.e. the Internet), fearing I would miss something absolutely critical. Unfortunately, the fact that missing anything important has not happened for the most part, hardly affects the worry and anxiety that it might happen. Yet still, it seems, this once motivating anxiety is becoming a repressed urge, one which is less and less a bother, the more my environment becomes one seamless, semi-omniscient “news” feed. On the evening of President Barack Obama’s Address to the Nation, Maya Escobar recorded “Obama Tweet: How a New Generation Gets Their Information.” In this video Escobar documented a particular event, an important cultural event, one which incidentally brought the use of Twitter to the fore in popular culture. I was with Escobar on this evening and was struck by the depth of her interaction with the digital realm. She was sitting in front of a T.V. broadcast of the speech, while she was also further mediating that media via her computer, on which she was following Twitter and CNN.com’s coverage of the event. Beyond all that, Escobar was creating her own real-time, indexical document of the event on television along with CNN and Twitter as instantaneous forms of annotations to the President’s speech. Escobar was watching, sitting one more stage removed, behind the lens of a video camera. Because of the way in which she layered the television screen the computer screen and then the interface of any viewer’s monitor, Escobar has effortlessly choreographed a multi-layered, engagement with the very most current of events. However, though I may have somewhat qualified and rationalized instant-communication tools, I still believe there must be a deliberate effort to complement those socially-prescribed media with other, independent forms of digital exchanges. While I do believe in the great social potential of our rapidly advancing communications media, my work seeks to push and pull on parts of these evolving global ‘informachines,’ in an effort to challenge the omnipresence of commercial media. That sort of layering of non-dimensional spaces is unique to the contemporary world, with the inception of digital technologies, and this collage-like aesthetic is of great interest to the work of Maya Escobar, as much as it is to my own. Although, unlike the deceptively referential works of my counter-part, in many of my works, I use and refer to popular media sources and specific Internet sites indirectly and rarely with any superficial visibility. It is with great deliberation and much hypothesizing that I curate my works in the manner in which I do. I intend my works to avoid specificity and leave wide-open their readings to a much more self-guided analysis by viewers. In the piece “Look Out,” the projected video came directly from YouTube. I simply cut off the last second of the original video, thus shortening it to 17 seconds. I then prepared it as a video-loop for its installation underneath a staircase at the Mildred Lane Kemper Art Museum. Because of its placement, where it fills a theretofore, unaddressed space, it is as though the rolling image is part of the museum structure itself. The particular clip, which I chose after viewing dozens of similarly tagged videos (‘storm,’ ‘tree,’ ‘willow,’ and ‘weeping’), was selected for very specific compositional reasons; reasons which are the very same principles of design taught to anyone working in commercial design or the visual arts: complimentary colors, rule of thirds, dynamic composition and varied textures, to name a few. Because of my focused selection process, this video, although created for very different (and unknown) reasons, still fits very well into the installation space as a deliberately designed, and potentially permanent use of what is otherwise a neglected space. The video became part of the stairwell. By existing within a predetermined, architectural frame, it became part of the space, as opposed to sitting on the surface as a painting does. This projection did not exist in the way that many (most) installations do: as obvious alterations or obtrusive interjections into a space. This work asserts itself as a physical part of the space, as the projector beams through from behind the scrim in the stairwell. It also assumes a living presence, as it reiterates itself, by many reflections and refractions, split and scattered, bouncing around the main hall of the museum. The video functioned as a decorative element but also an illusory window to an outside world, whereas, the space without that piece is simply a pane of glass that looks into the shadowy crotch of a stairwell. I do not mean every square inch should be taken up for some sort of visual activity or illusionary window. Simply, this work proposes how our constructed spaces, in this case a venue for art viewing, might be reinterpreted. Insofar as, a corner can conceivably become a window, as illusory and impermanent as my particular interpretation may be. Every art student learns about the fair use principle, granting us permission to use any image in our artwork as long as we transform it so that it conveys new meaning. But beyond that all-encompassing definition, we don’t know what transgressions, if any, we are actually committing. Recently in the news is the preemptive lawsuit artist Shepard Fairey filed against the Associated Press. According to Fairey the AP threatened to sue him unless he pays royalties for the image that he used as source material for his now famous campaign poster of Barack Obama. Fairey argues that he is protected by the fair use principle. 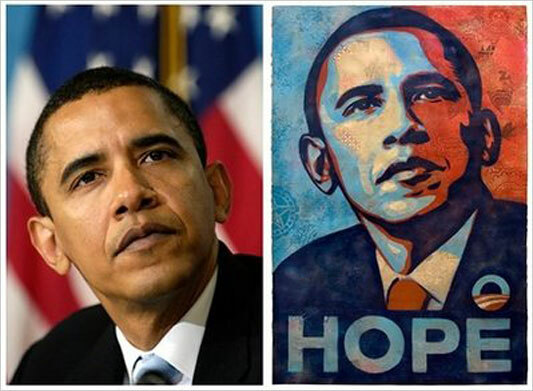 He claims that his intention was not to reproduce any particular image, but instead was to capture a specific gaze representative of the ideas of hope and change. 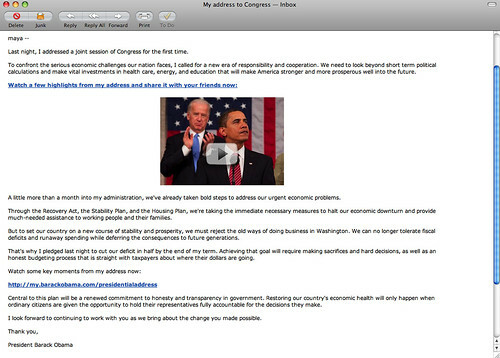 In an interview on NPR, Fairey declared he was going forward with this suit on behalf of all artists, the thousands of artists that created their own campaign images in the same grassroots manner, pulling images from the web in support of the message of hope, change and a new administration in Washington. I am fascinated by Fairey’s implication that the process of appropriating and re-contextualizing Google image search results might be considered a grassroots action. As an artist, I frequently use images that that I find on Google. Like Fairey suggested, my motivation for using these images is to highlight the search itself, not the derivative image. 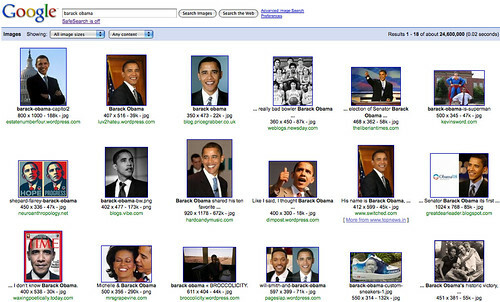 Perhaps then, these cyber Robin Hoodian actions—using and transforming Google image search results—are capable of changing the structures that control the dissemination of information. After all, the order that information appears in Google searches is determined by the amount of people searching any given topic. And as a result of the Fairey’s appropriation, his campaign poster may be forever linked to Obama’s presidency. You are currently browsing entries tagged with st. louis at Maya Talk.